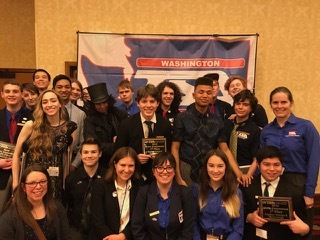 The Technology Student Association from Shorecrest sent 22 students to the Spring Conference March 8-10, 2018 of the Washington Technology Student Association. 19 of the 22 students placed in the top 5 in at least one event. 1200 people attended from around the state, including high school students, middle school students, and teachers. There were approximately 35 different events to compete in at the high school level. Advisor Kari Potter added "And, to top it off, Stella Beemer was elected as secretary for our state TSA officer team. Way to go Stella!! The whole team helped campaign for her, and it was awesome to watch." The next step is the Nationals in Atlanta, Georgia. The team is looking for donations to help them attend. If you would like to help, donations can be made to Shorecrest High School with TSA in the check memo line, or people can contact Advisor Kari Potter for more information.